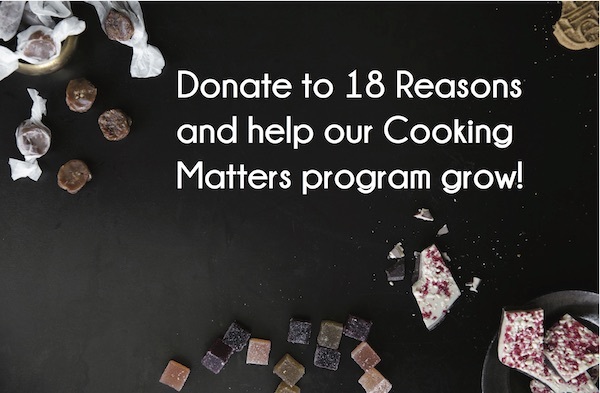 Joining 18 Reasons offers great benefits and helps support our Cooking Matters program. Membership lasts for one year. You will receive a membership card in the mail within one week of joining 18 Reasons. Just show this card to neighborhood businesses to receive your discounts! $50 COOK: Purchase two tickets at the discounted Member-only price for our events, discounts at neighborhood businesses, access to Members Only events, plus our member newsletter with early notification of new classes. 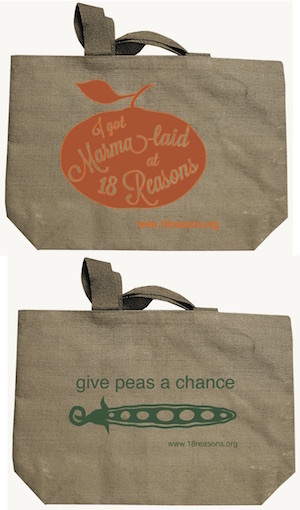 $100 CHEF: Choose one of our new tote bags* to go with your delicious discounts and Members Only events! $250 RESTAURATEUR: Our fabulous discounts, your choice of tote bag*, one free class of your choice per year, and extra early invitations to our most popular events. Free class discount may not be used for multi-day class series. $40 STUDENT/SENIOR CITIZEN (65+): Discounts on our classes and at neighborhood businesses, access to Members Only events, plus our member newsletter with early notification of new classes. Group memberships for nonprofits & companies are available. Please contact info@18reasons.org to inquire. All members’ children under 18 years old receive a complimentary membership. Memberships can also be purchased at any 18 Reasons event and at both locations of Bi-Rite Market. To renew your membership, make sure you are logged in, and purchase a new membership. The purchase of a new membership will automatically extend your membership by one year. *New custom tote bags for all of your shopping needs!